Concord grapes are dark blue-black grapes that are slip skin in nature (the skin is easily removed from the flesh). These aromatic grapes are not typically found for sale in stores, as they are used primarily for jelly and juice. Ripens in September. The Catawba is a purplish-red grape with a rather sweet flavor. 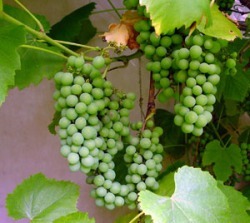 Rather than table eating, this grape is primarily used in wines, juice, jams and jellies. Ripens in September. Niagara is a beautiful white grape with large bunches. It is a natural mutation of the famous concord grape. So, it is basically the white version of a concord grape. Therefore, the Niagara is excellent for jelly, jams, preserves, and fresh juice. Fredonia is a deciduous vine that is normally grown for fruit, wine, and shade. It requires full sun and medium amounts of water, with good drainage. When well cared for, it can be productive for 50 or more years.